The iPad is a great tool for providing supplementary visual perceptual and visual motor therapy or home programming activities. Features of the iPad can allow verbal feedback on performance, language reinforcement and options of graded activity levels to the user depending on the app. Perusing educational app curation sites I found a few visual perceptual apps that were highly rated for preschoolers that I thought would be worthwhile testing out. Here are a the two apps that came with good recommendations for preschoolers. They do have good qualities, however what aged child might you use these apps with?? 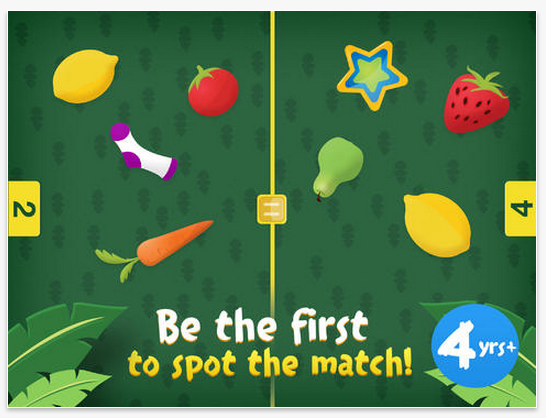 Match Blitz app (free; iPad/iPhone) from the developers at Shiny Things is a high quality matching game for young kids. 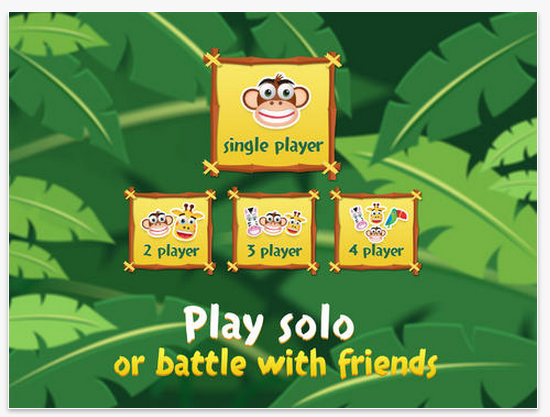 The matching game can be played individually, with 2, 3 or 4 players. It requires quick matching of shapes and objects. 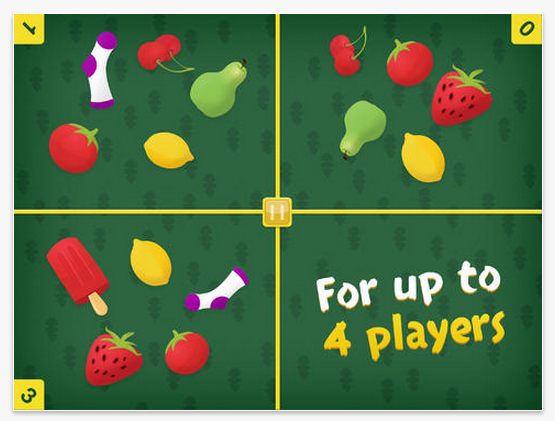 The matching game can be played individually, with 2, 3 or 4 players. 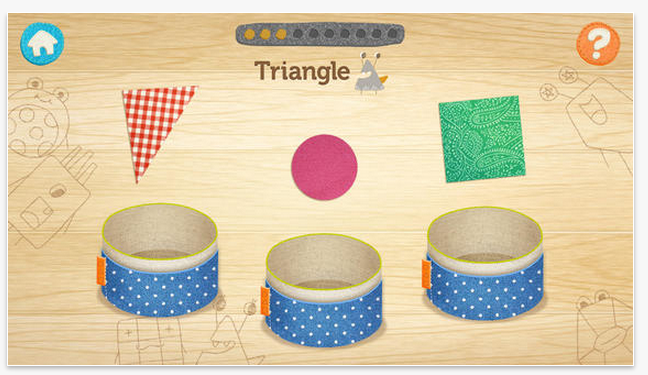 It requires quick matching of shapes and objects to beat your time. 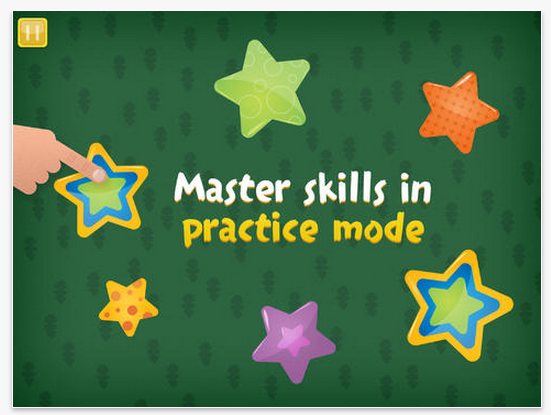 A practice mode is provided for students to learn how to play the game. Difficulty of matching does increase somewhat in quantity and complexity of objects, but remains appropriate for preschool aged players. Speed of responses is timed and displayed at the end, but, speed is not increased as you progress in the games. No instructions are given for the game. The practice mode is sufficient for young player to successfully play Match Blitz!. Although a simple game and app, Match Blitz! 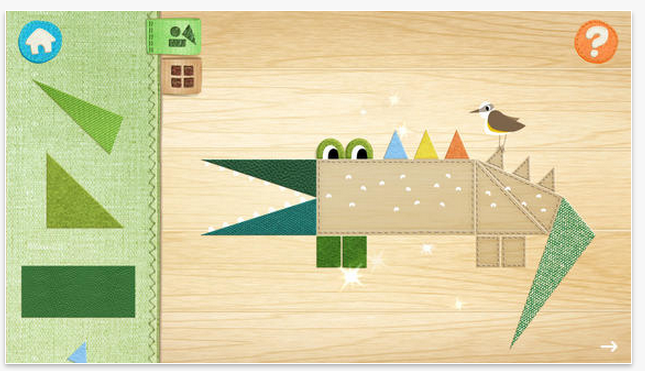 is a quality app that is engaging for preschool to early elementary aged children. Well worth the download to your device. Doodle Critter Math: Shapes (2.99; iPhone/iPad) provides a variety of visual perceptual and visual motor activities within one app. Created by NCSOFT, creator of Injini and Write My Name apps, Doodle Critter Math focusing on early math skills of learning shapes, matching shapes, finding shapes and sorting shapes. Six different activities are offered in this app. Learn shapes, describes and draws out shapes. Remember shapes presents and then hides shapes to be found by the user. 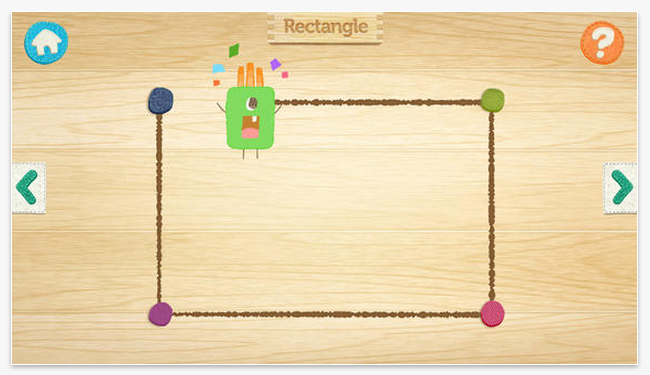 Drag the shapes to complete the puzzle, provides shape matching to complete the picture. 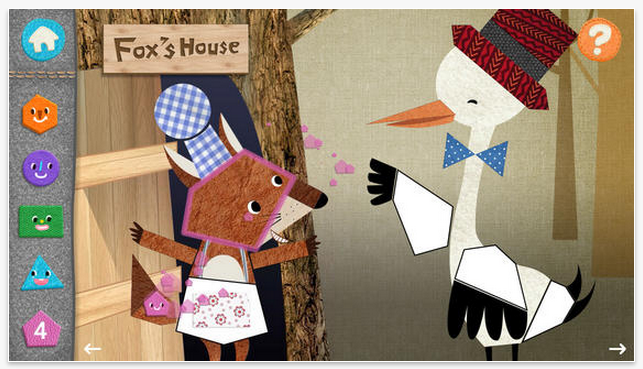 Find shapes in the fable, focuses more on individual shapes, recognizing shape names and matching. Doodle Critter Math: Shapes is engaging and offers language and text in most activities provided. Although it is suggested for preschool students, it appears suited early elementary students due to the language content, skills levels randomly presented and a somewhat fast pace of some activities. In a few activities, the skill of the task was in a random order rather than a developmental sequence. Identifying hexagon or pentagon shapes was presented at the beginning of a new activity rather than presenting circles, squares in a developmental order. The matching shapes activity required identification of 8 to 13 (or more) shapes to complete a picture puzzle, which would be considered complex for many special needs preschool students. 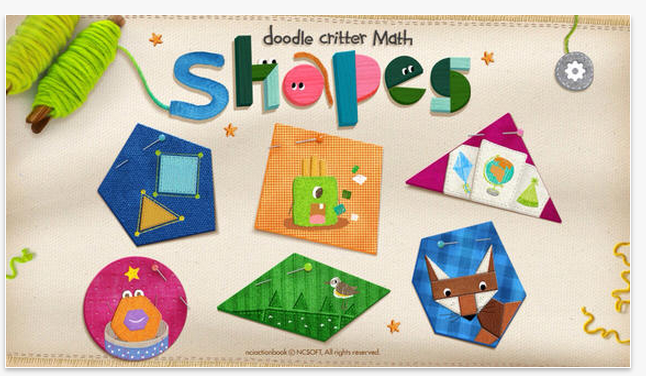 Doodle Critter Math: Shapes is a quality app, but may be best suited to more neurotypical students or for kindergarten or elementary level students with basic shape recognition (circle, square) who would benefit from advancing their skills. Options offered the setting include music sound levels, turning effects on/off and languages offered (English or Korean). If you are in need of reinforcing shape identification with language, Doodle Critter Math: Shapes would be appropriate. This app might be frustrating for students who need tasks offered in a developmental sequence to be successful. Both apps have their merits. What ages would you use these apps with? Are these apps that you will download for your teaching, parent or OT mTool Kit? Interested in practical review of apps for visual perceptual development of your child or student? Come to the OT’s with Apps Workshop this August – we’ll be reviewing visual perceptual and visual motor apps (and many other apps for OT!) along features and practical ways to use your iPad in therapy! This entry was posted in App Reviews, Apps for OT's, Apps for Special Needs, Early Childhood, iPad, iPhone, iPod, Primary Grades, Visual Perception and tagged App Review, Early Childhood, iPad, occupational therapy, OT Apps, special education, Visual Perception. Bookmark the permalink.